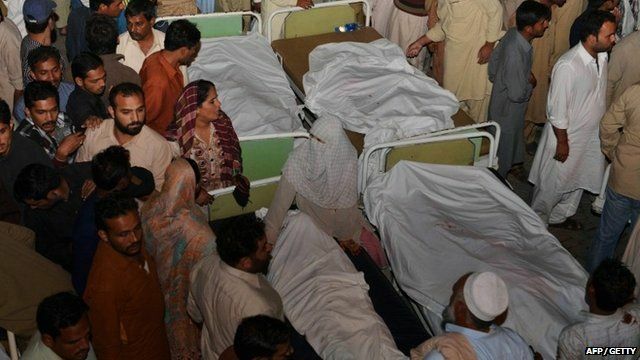 Pakistan 'suicide' blast 'kills many' Jump to media player At least 50 people have been killed and 70 hurt in a suspected suicide bombing at a Pakistan-India border town near the city of Lahore, officials say. Pakistan polio plan 'a disaster' Jump to media player The polio vaccination programme in Pakistan has been described as ''a disaster'' by monitors reporting to the World Health Organization. Acid attack survivors' refuge Jump to media player Musarat Misbah, the owner of a chain of beauty parlours in Pakistan, has set up a charity to help care for acid attack survivors whom she also employs in the salons. More than 50 people have been killed and at least 100 injured in a suicide bombing close to Pakistan's only border crossing with India. The blast was near the checkpoint at the Wagah border crossing, near Lahore. At least three jihadi militant groups, including the Pakistani Taliban, have claimed responsibility for the attacks, as Shahzeb Jillani reports.